Rowe, K. and Charles J. G. Verge. "Postage Stamps". The Canadian Encyclopedia, 07 January 2019, Historica Canada. https://www.thecanadianencyclopedia.ca/en/article/postage-stamps. Accessed 24 April 2019. The first adhesive postage stamps were issued in Great Britain on 6 May 1840 as part of the innovative postage scheme proposed by Sir Rowland Hill in 1837. Prepayment of postage by the use of stamps was a practice quickly adopted by many countries. 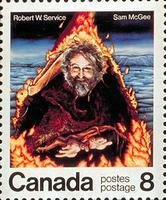 Designed by Sir Sandford Fleming, it was Canada's first stamp (courtesy Canada Post Corporation). Postage stamp commemorating the invention of kerosene, 1846 (courtesy Canada Post Corp). 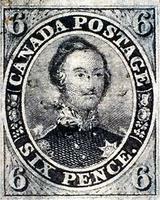 One of Canada's earliest postage stamps, issued 1851 (courtesy Canada Post Corp). The first adhesive postage stamps were issued in Great Britain on 6 May 1840 as part of the innovative postage scheme proposed by Sir Rowland Hill in 1837. Prepayment of postage by the use of stamps was a practice quickly adopted by many countries. The provinces of Canada followed the lead of Britain, beginning with the Province of Canada, Nova Scotia and New Brunswick (1851), Newfoundland (1857), BC (1860) and Prince Edward Island (1861). All the provinces ceased to issue their own stamps and used the Dominion of Canada general issue as they joined Confederation. Newfoundland continued to issue its own postage stamps until it too joined Confederation (1949). 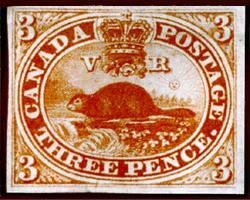 Canada's first stamp was the Three-Penny Beaver designed by Sandford Fleming. It was issued 23 April 1851, and was the world's first pictorial stamp. Stamps prior to this depicted either the head of the ruler or some other official device. Until the post WWII period most Canadian stamps were designed by staff artists of the various security printers under contract to the Post Office. In the 1950s, however, more emphasis was placed on design, and the policy of inviting designs from individual artists was begun. Since 1969, stamps have been chosen on the advice of a Stamp Advisory Committee made up of competent people such as scientists, artists, printers, stamp designers, historians, social scientists and philatelists. The present committee is headed by the chairman of the board of Canada Post. Subjects and design proposals are examined by the Stamp Advisory Committee and a stamp program is recommended to the Board of Directors of Canada Post. Stamps have a monetary value and are produced only by security printers under very strict control. The production methods must be difficult to duplicate in order to prevent forgery. Almost all Canadian stamps issued before 1967 were printed by an engraving process, like banknotes. In this process the design is engraved in actual size in reverse on a block of steel called the master die. During this process various prints are made to show progress; these trial prints are called "die proofs." When a die proof is approved by Canada Post, the die is hardened and impressions of the design are transferred to a hardened steel roller. The impressions are then rolled into a steel plate, curved to fit modern rotary presses. A recent modification of this process involves the transfer of the plate impressions to a plastic sheet which is then used to produce an electrolytically deposited duplicate used for printing. In the late 1960s the techniques of multicoloured offset lithography were sufficiently developed to use this process in stamp production. Since then Canadian stamps have been unrestricted in their use of colour, giving stamp designers far greater flexibility than when confined to the one-colour or two-colour process. Current designs often combine gold and silver elements, foil stamping, embossing and die cutouts to enhance the appearance of some special issues. In 1992 a specially designed hologram was used for one of a pair of stamps (known to philatelists as "se-tenant," or joined together) to commemorate Canadian achievements in space. Several other Canadian stamps have received the holographic treatment since then, notably one of the stamps issued to commemorate the millennium. Several kinds of paper have been used, including laid, wove and coated varieties. During recent years the sheets of stamps have been overprinted with a transparent ink that when exposed to ultra-violet radiation fluoresces. This process assists in the process of mechanical sorting of various classes of mail. The use of these printing methods and papers has given Canada unusual variety and beauty in stamps. In fact, since the mid-1990s, Canada has regularly won major awards for the beauty of the design and the excellence of the production of its stamps. Canadian postage stamps are used strictly for postage purposes. Some countries, notably Britain, have their stamps inscribed "postage and revenue," thus validating them for both postal and excise use. In Canada special stamps are made available for excise purposes by both federal and provincial governments.